The only clock you need in your wine room or cellar! Ever wondered what kind of aging conditions you've been subjecting your barrels and bottles to? Ever lose track of time in the wine room and forget to do something you told the "better half" you'd take care of? Well then this lab-grade clock/thermometer/hygrometer is just what you've been waiting for! 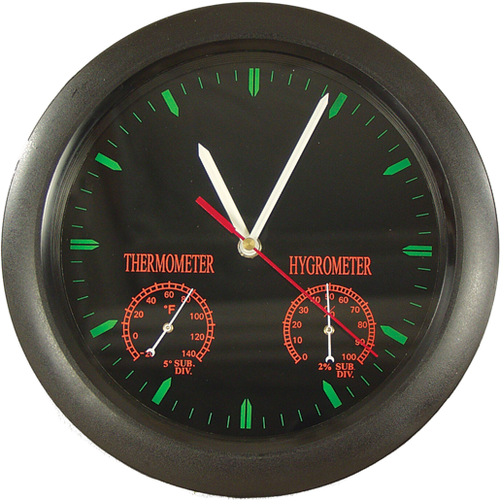 The large 10" clock has light, easy to read hands, with the thermometer and hygrometer built into the middle. Read the time, temperature and ambient humidity in a snap! How is the clock powered? BEST ANSWER: Hi Anthony - It required one AA battery that is not included.